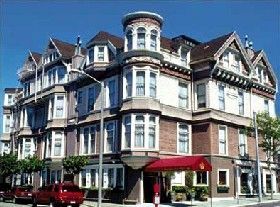 Queen Anne Hotel – Opened in 1890 as Miss Mary Lake’s School For Young Ladies, the school catered to the wealthy young women of San Francisco. However, the school didn’t last long and closed around 1896. Over the decades the building changed hands numerous times until 1980 when it was renovated and reopened as the Queen Anne Hotel. Apparently, Mary Lake is reluctant to leave the hotel and lurks about the fourth floor. Most commonly she is seen as a misty figure, but has also been known to unpack visitor’s luggage, replace dropped pillows back on the bed, and occasionally even tuckes guest into bed. Queen Anne Hotel, 1590 Sutter Street at Octavia, San Francisco, California 94109, 415-441-2828 or 800-227-3970. The Santa Maria Inn – A Central Coast landmark since 1917, The Historic Santa Maria Inn blends the style of an old English country inn, the elegance of a bygone era and the gracious hospitality of the Santa Maria Valley. Catering to hundred of visitors over the decades, some of them seemingly choose to stay at this historic inn. Ghost stories abound here of mysterious footprints, a piano that plays by itself, and music coming forth from disconnected speakers. One legend tells of a sea captain and his mistress who stayed in the hotel long ago. Murdered by his mistress, the captain continues to appear at the hotel. The inn is also allegedly visited by Rudolph Valentino, who likes to knock on the door of Room 210. I this room, an invisible presence has also been known to recline on the bed. The Santa Maria Inn, 801 South Broadway, Santa Maria, California 93454, 805-928-7777 or 800-462-4276. Georgian Hotel – Built in 1933 and originally named The Lady Windemere, this historic hotel was designed to be an intimate hideaway, catering to Los Angeles’ high society. In the hotel’s Speakeasy Restaurant, both staff and guests have reported a number of strange phenomena over the years. At many times when the restaurant is completely empty, employees have heard loud sighs, gasps and have been startled by a disembodied voice who greets them with, “Good Morning.” At other times the sounds of running footsteps are heard throughout the restaurant when no one is there and a number of transparent apparitions have been seen. 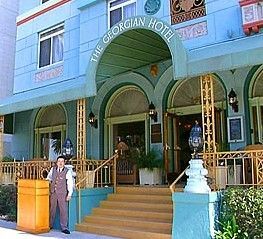 Georgian Hotel, 1415 Ocean Avenue, Santa Monica, California 90401, 310-395-9945 or 800-538-8147. The Sutter Creek Inn – Located between Yosemite National Park and Lake Tahoe in the heart of the Gold Country, this bed and breakfast is considered by many to be the “Jewel of California’s Mother Lode.” The inn is thought to be haunted by a former California senator and his wife. He is often heard pacing upstairs in the main house and his wife is sometimes seen in the hallway. Sutter Creek Inn, 75 Main Street, P. O. Box 385, Sutter Creek, California 95685, 209 267-5606. Bella Maggiore – Located in downtown Ventura, the Bella Maggiore is a lovely 1825 Italianate building. It is also haunted by a number of ghosts that are known to roam the hallways. In Room 17, the ghost of Sylvia, a prostitute who committed suicide in the room around the time of World War II, has been known to knock on the door. However, she only knocks only appears at the door if the room is occupied by a male. Bella Maggiore, 67 South California Street, Ventura, California 93001, 805-652-0277 or 800-523-8479. Pierpont Inn & Racquet Club – This craftsman style inn with storybook cottages was built in 1910 with the intension of drawing a growing breed of automobile drivers venturing up and down the coast. Since 1928, this 11-acre resort has been owned and operated by members of the Vickers family who have lovingly maintained its historical integrity. In 1999, the inn began a full schedule of renovations that have brought about a number of ghostly spirits. One such visitor that appears throughouth the hotel is thought to be a former owner. This phantom lady, always dressed very formally, has been seen in massage rooms, dancing in the parking lot or leaving wet footprints on the lobby floor for the cleaning crew. Another entity has been seen in the bar, appearing as a ghostly mist. The Pierpont Inn & Racquet Club, 550 San Jon Road, Ventura, California 93001, 805-643-6144. Victorian Rose Bed & Breakfast – Said to be one of the most unusual bed and breakfasts in the country, the inn in an old Victorian Gothic Church. Complete with its original 96-foot steeple, elaborately designed stained glass, 26-foot-high carved beam ceilings, and eclectic architecture and furnishings, the Inn presents a lodging destination like no other. The Emporer’s Bedroom, once a choir loft, houses the spirit of a woman who was killed when she fell from the loft. Guests report that they still hear her singing. A phantom preacher has been known to sometimes tuck guests into bed. Ventura Rose, 896 E. Main Street – Ventura, California, 805-641-1888. 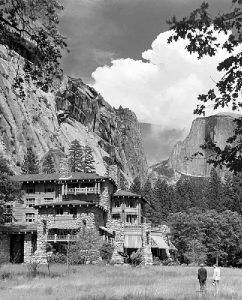 Ahwahnee Hotel – Open since 1927, The Ahwahnee is one of America’s most distinctive Registered National Landmarks. In the beginning, as well as now, the hotel offered every comfort in the midst of the rugged Sierra Mountains. Yosemite Miwok woven cooking baskets, linguistic symbols and decorative patterns can be seen throughout the Ahwahnee’s rooms and halls. Allegedly, there are two World War II era ghosts that haunt the mezzanine level and the 3rd floor! Ahwahnee Hotel, East of Yosemite Village, Yosemite National Park, California 95389, 559-253-5635.